Dear Unk and other loafers. May heaven forgive you for I never will. Not content to revel in my discomfort – you – my so called friends – send me sand. Always grateful – I thank you. I shall now grow a cactus in it and teach it to bite anything resembling a printer. Not but that I could let it loose in the machine room with safety after what my horrified eyes saw on my last visit. “The Royal” is the best thing you do and then only because of the interesting personalities it features. from the blessed isle. Normally I should not attempt to write again from here, but feel constrained to do so by the evidently overwhelming joy that imbues your breasts at my continued incarceration. piece, but nevertheless – grimly and remorselessly. If I don’t get off this place soon I shall develop a lovely pair of web feet. their flying practice ready for the big day. Turning to more serious things – if possible – I can now pass some private information. Knowing your reticence I would not like the rest of the chapel to know that Wyn and Kitty wrote me and asked how Bill and Bert were. I was pleased to reply that I understood you were both suffering terribly. If this should be wrong I am only too glad to have given the wrong impression. The next time I go out with anybody I shall go alone. Then I won’t have to make excuses for the low company I keep. bloke when I haven’t got his address? Besides he seems to be taking this war too seriously. Instead of easing it along gently he’s trying to rush it. Lets [sic] get some of the old team in first. They scored alright in the last match. There is supposed to be a relief party coming out to take our place but if the perishers hear what this dump – joint or gaff is like they’ll very likely go over the side. Then we shall be left holding the can. And the can is something I don’t like holding unless it is full of beer. Sorry Mr. Hunt, but as you remark, my mind never gets above the froth of the navel. my letters concerning it [deleted] well [/deleted] will make “Decameron Nights” read like “East Lynne”. All that sustains me through these weary days is the thought that somewhere someone is thinking of me. Not that I care, I think the same about you, only more so. I like to sit and think that one day, from the snug security of a back turret, I shall see some of my best friends perched precariously on this corner of heaven. Especially “old railings” – and the other two bloody inventors. It would rather suit brother George here. With his bow and arrers[sic] he would be the best atoned man on the island. The natives still use flint axes. the usual lies. Hope everyone is well and dont[sic] get hurt. Remember me to the OPA’s – Frankham – Woaker – Freddie Cox – Fred Cooper – Speedy. Tell the maintenance I often think of them – when I want to be really miserable. P.S. I didn’t mention Harry Ashton this time as what I think of him is always unmentionable. P.P.S. Should “old railings” break his neck let me know – I want to be the first to send congratulations. I often wondered if you’d all be dumb enough to turn over when I put P.T.O. 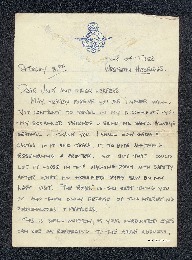 Peter Lamprey, “Letter from Peter Lamprey to W Gunton,” IBCC Digital Archive, accessed April 20, 2019, https://ibccdigitalarchive.lincoln.ac.uk/omeka/collections/document/6644.